Mystical, breathtaking, awe-inspiring. Words really fail to covey the power, magic, and beauty, of the northern lights as they dance across the darkened horizon. Science says these ghostly illuminations are caused as solar winds created by our sun as they pass through the earth's magnetosphere. For a layman like myself that's a magnetic envelope that surrounds our planet. To get an idea of what this looks like, put a magnet under a sheet of paper and then pour some iron filings on the paper, As you move the magnet you will see a spherical energy pattern emanating around the magnet that is more or less what the magnetosphere looks like. Part of the northern light's magic is its endless variations in size, scope and color. Like DNA and human fingerprints no two auroral events are ever the same. These celestial performances in the heavens can last for a mere minutes, or play all the night long from dusk till dawn. They also come in a vast array of colors like Electric Green, Teal BLue, Lemon Yellow, Orange and every hue in between. And if you're real lucky on your visit to Fairbanks, you might witness one of those rare occasions when the Aurora turns Red. Eskimo legend says that the Aurora Borealis are spirits playing ball in the sky with a walrus skull. 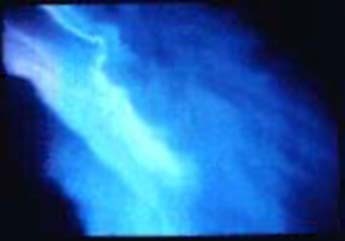 In another Native Alaskan legend it is stated that the Northern lights are flaming torches carried by departed ancestors who now act as guides for travelers on their way to the after life. Best viewing is usually done between midnight and 6 am. And from the top of most of the mountains surrounding Fairbanks you can almost get a horizon to horizon view of the aurora's activity. But one of the wonderful things about Fairbanks is that almost no matter where you are, when the aurora is performing its midnight dance overhead, you can clearly see it. I should also mention that the most spectacular aurora displays usually occur in the months of September, October, February and March. Getting your own prize winning photographing of the aurora is not difficult. Using a wide-angle lens, or for your more modern 35 mm cameras set it on landscape. If you have a tripod you may want to use it or just try holding your camera as steady as you can in two hands and try not to breath as you click the camera shutter. You should also try slower films such as ASA 100 to 200. If you have an older 35 mm camera shoot the picture at the F-2.8 setting, and then manually hold the shutter open for about 15 to 20 seconds. Beleive it or not all of these shots were taken during a single evening. NOTE: Unlike so much of the phenomenon in the Fairbanks area beautiful Aurora's are not a nightly occurance, other exceptions to viewing it are of course of heavy cloud cover. 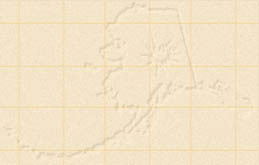 When planning your trip to Fairbanks you can always check the local five day weather forecast Online at the bottom of Alaskan Dreams Opening Page or Call the Fairbanks Weather Service for the local Aurora Forecast at: (907) ---------. The Aurora Tour from 40 Below Tours: Offers a wonderful tour package which includes round-trip transportation to Mount Aurora, paid admission to the lodge, hot drinks, and snacks. Leaves Fairbanks about 10 p.m. Tour can last as long as five hours. P.O. Box 71677, Fairbanks, AK 99707; phone: (907) 451-1125; fax: (907) 451-1127. $60 per person. P.O. Box 73440, Fairbanks, AK 99707; phone: (907) 452-7867; fax: (907) 456-3122. Hotel rooms are approximately $105-$125. Cabins $50 for two or $110 for up to six people. Trapper Photographs Since 1990 Bernie has been photographing the true beauty of the Aurora Borealis as they appear in the southern half of the Northwest Territories. This site offers dozens of high quality photos, and a screen saver. This is a must see video clip. The scene is looking directly overhead and was made from 36 2 second exposures on 35 mm film. Actual time is 84 seconds. Using the lower altitudes of the aurora, this would cover approximately 75 miles. This is another page from UAF with more photos of the aurora and lots of information as well. 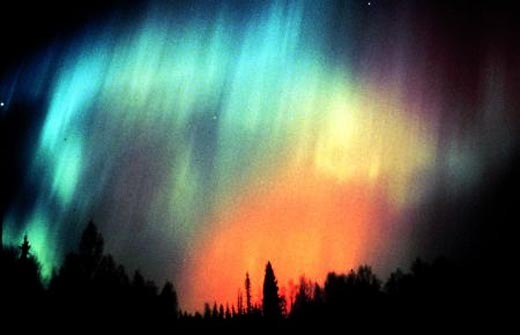 The Aurora Page contains photographs by Jan Curtis. On this site there are nine pages of incredible images, selected from the works of Jan Curtis. These photographs were all taken in and around Fairbanks, Alaska. Ski's Aurora Borealis Photos. These photos were taken in my backyard on November 14, 1991. 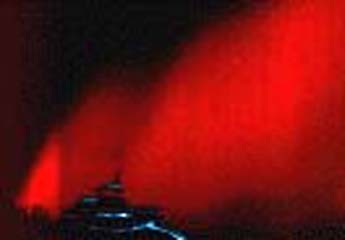 Arctic/Northern Culture -- "Aurora Borealis" Filled with absolute gems Arctic/Northern Culture is an very extensive E-Zine that covers a lot of interesting Alaskan topics. Its definitely worth your time to thumb through what all they have. You never know what you may find. This site will show you what auroras look like from space and on Earth, explain how they are created, and show you where they can be found.